Author Linda G. Mills is a scholar, lawyer, social worker, and the founder of the Center on Violence and Recovery at New York University. 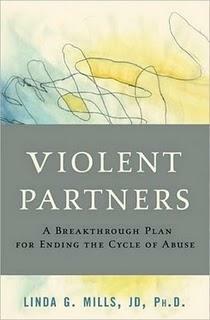 In Violent Partners, Mills challenges the tenets of the battered women’s movement. These basic principles held that: domestic abuse was caused by deeply rooted misogynist beliefs, which condoned violence against women; women were rarely violent; if women endured the abuse and didn’t leave, it was because they feared the consequences; and criminal action had to be taken against violent men. Mills proposes a controversial breakthrough plan to end the cycle of violence, which includes counseling for violent couples who want to stay together, group counseling, and healing circles. The author believes that the criminalization of domestic abuse has been unsuccessful in ending the cycle of violence and, in many instances, has only exacerbated the problem. Although Mills uses many compelling cases to support her arguments, she fails to give the reader a specific case to illustrate what it might have been like to be a victim in the late 1960s, before the women’s movement had championed the cause. This would have given the book a more balanced perspective. The author also uses some statistics that give a skewed picture of violent women in intimate abuse cases. For instance, the author cites a U.S. Department of Justice-funded study, which has neither footnote nor name, showing that arrests in California for domestic violence between 1985 and 1995 grew by 37% for men and 446% for women. These figures were to illustrate the author’s claim that the number of violent women was dramatically increasing. However, there is no mention that this surge could be attributed to increased reporting by men or greater public awareness vis-à-vis domestic violence. In addition, these figures don’t give the reader a clear idea of the percentage of domestic violence cases that are actually perpetrated by women. In Family Violence in Canada: A Statistical Profile of 2004, published by the Canadian government, it states that “females are more likely to be victims of spousal violence (85% vs.15%),” a figure based on domestic abuse offenses reported to police. Mills objects to the generalization that men are always the perpetrators and women are always the victims. She believes that both partners play a role in the dynamic of violence and that understanding this dynamic is key to stopping any recurrence. I believe that the author’s intention was to emphasize the importance of understanding the dynamic rather than pointing a finger at one gender, but unfortunately, what many may take away from the book is that women are just as violent as men. This, in turn, could seriously undermine the support for and financial well-being of the current system, which has undeniably saved tens of thousands of lives in the past thirty years. The book is convincing in its explanation of who becomes violent and why, and the impact of domestic violence on future generations. Mills is also successful in showing the complexity of intimate abuse. What’s more, the author makes it abundantly clear that we now know a lot more about family-related violence than we did thirty years ago and that with our new wisdom, we should embrace new solutions. I applaud the comprehensive approach that involves looking for new ways to stem violence in future generations. I also found the peacemaking and healing circles to be a promising and relatively inexpensive remedy, which could work in certain situations. However, I would only recommend this book to therapists, public health policy makers, and professionals working with victims of abuse and in the criminal justice system.